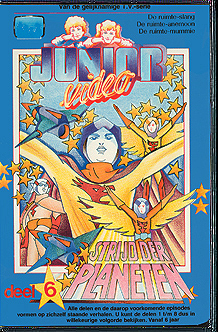 Eight VHS volumes of Battle of the Planets episodes were released on the Video for Pleasure sub-label, Junior Video. 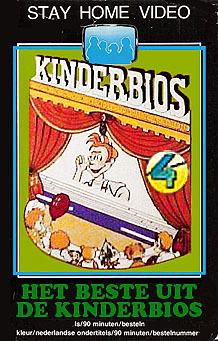 Each volume contained three episodes dubbed into Dutch in PAL video format. Volume 6, pictured above, contained "The Space Serpent 4," "Fearful Sea Anemone 8" and "The Space Mummy 3." 1982, by Ring Editions Hilversum. Several anthlogy home video releases for the rental market in the Netherlands contained Battle of the Planets episodes. Known tapes in the Stay Home Vieo line included Volume 2 ("The Bat-Ray Bombers 23") and Volume 4 ("The Galaxy Girls 26") of the "Best of Children's Cinema." Volume 4 is pictured above. Approximately 1982, by Ring Editions Hilversum.